Mary Slessor pondered David Livingstone's words, "I don't care where we go as long as we go forward." "I'm not going anywhere, Mary mused. I'm twenty-seven years old. I work in a cotton mill twelve hours a day. God, Mary prayed, send me somewhere, anywhere, just send me to be a missionary." God would indeed answer the prayer of the fiery, red-haired woman from Scotland. 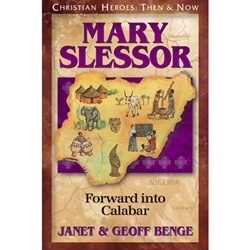 For thirty-nine years, Mary Slessor would labor in love among the unreached, often treacherous, tribes of Africa's Calabar region. Braving sickness, danger, and death on all sides, Mary became the cherished "White Ma" to entire tribes. Her faith, steadfastness, and pioneering spirit brought her beloved adopted people their first brilliant, contrasting example of the life and freedom found in Jesus Christ. Mary Slessor's story in an ageless epic of a woman who would stop at nothing to reach the lost with the life-giving gospel of Christ. (1848-1915).